Recently we discovered the most hated programs of all time, but when we hit the publish button we felt a little bit sad. We're lovers, not haters, and software has brought us lots of great moments over the years. There's only one thing for it: let's restore our happiness by talking about the good stuff, the programs that are - or were - loved by millions. Have we missed any of your favourites? Let us know in the comments. To the best of our knowledge, nobody's ever been sent to prison for using Excel - but plenty of people were willing to risk the long arm of the law to use Napster. The software wasn't exactly a design classic, but that didn't matter, because Napster offered its users something priceless: free music. Admittedly that was free, illegally copied music, but hey! Free music! Today only the logo lives on: it's been absorbed by Rhapsody. Male music fans of a certain age go all moony-eyed when you mention Betty Boo, and similarly ancient Apple fans do the same when you mention Hypercard. Bill Atkinson's application offered a kind of hypertext years before the World Wide Web was invented, and it made application development effortless. As Douglas Adams wrote: "it's a sensationally good idea, and I would dearly love to see something like it become the whole working environment for the Mac." Sadly HyperCard was shuffled around inside and outside Apple, and the much-delayed, unreleased HyperCard 3.0 was canned when Steve Jobs lost interest in it. For some, MS Paint was the first time they'd ever drawn using a computer - and for many more, it was the tool that enabled them to draw as if it was the first time they'd ever drawn using a computer. The program's fundamental rubbishness made it a top tool for comedy - it's still the tool of choice for messageboard LOLs - but it also inspires awe whenever somebody draws something good. We'd love to know how many early Firefox users switched because of technological reasons, and how many for ideological ones. We suspect for many people it was a bit of both. Mozilla's Netscape-derived browser suite was rather lardy compared to the all-conquering Internet Explorer, so three developers started a project to make something that wasn't just an alternative, but a really good alternative. The soon to be renamed Phoenix became enormously successful and was loved by users and web designers alike. Plugins, layers, cliches (lens flare, page curls) and the ability to make us question whether what we're told is real is really real or just really realistic - not bad work for a single program. Photoshop's effect on the wider world has been extraordinary, and while it's (ab)used by goons and the advertising industry to distort reality it remains an astonishingly powerful creative tool. In the days before Windows, there were two kinds of word processing software: WordPerfect 5.1, or the rubbish your boss made you use because he hated you and wanted to make you suffer. On Windows, however, it died on its arse: the first Windows version wasn't very good, and by the time WordPerfect 5.2 for Windows shipped Microsoft's Word for Windows was in the ascendant. 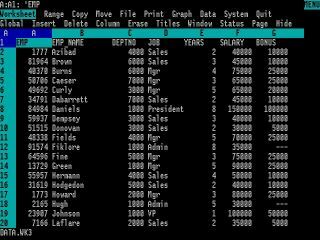 If it weren't for Lotus 1-2-3, we might not have any of the tech toys we know and love today: the Visicalc-inspired spreadsheet package was the IBM PC's first killer app, and you can still see its influence in more modern applications such as Excel or Numbers. Like WordPerfect it didn't see Windows coming and was stomped by a Microsoft rival, in this case Excel. Writers tend to fetishise things - Moleskine notebooks, say, or IBM typewriters - but when you hear them banging on about Scrivener they're not doing so because they think it makes them sound cool and interesting. If you have to write things - any kind of things - that involve lots of research or just lots of ideas, Scrivener will delight you. It's one of those programs where you keep discovering new, cool things it can do, and if you told us it had an attachment for getting stones out of horses' hooves we'd believe you. Check out our Scrivener review. Has any program wasted more corporate man (and woman) hours than Microsoft's card game? Its presence on an office PC was a source of great joy to bored white-collar workers, as it's quiet enough and clicky enough to make it look like you're still working without giving the game away. If we'd used all the time we've spent on Solitaire to study science, we'd have cured cancer by now.